Wasps' director of rugby Ian McGeechan says expanding their Adams Park stadium is key to helping the club keep its status as one of the biggest in Europe. 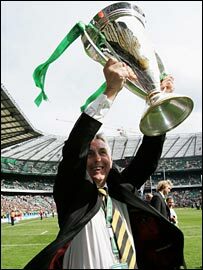 The Heineken Cup holders' High Wycombe home has a capacity of 10,000, but McGeechan says they need more. "We're creating a fanbase here which is important long-term but we must develop the ground beyond what it is - everyone understands that," he told BBC Sport. "For a professional stadium, you need to be looking at a capacity of 15,000." In the last decade Wasps have picked up a remarkable 10 trophies, including three Premiership titles and two Heineken Cups. Following the second of those Heineken Cup wins, over Leicester in May, captain Lawrence Dallaglio called for the club to match the players' achievements with their off-the-pitch ambition. One of the first moves towards that has been the appointment of new chief executive officer Tony Copsey. McGeechan admits that while the players have embraced professionalism, off the field there is some catching up to do. Should bigger games be moved to a bigger ground? "We've been in Wycombe for five years and in that time the rugby has taken off, but the business has been finding its feet," he said. 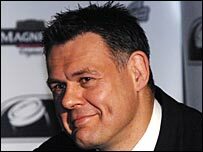 "Not owning our own ground, the business model here is different to clubs like Leicester and Northampton, who own theirs, so there is a slightly different thought process required to make the business side of Wasps successful." Adams Park is Wasps' third home since the advent of professional rugby in 1995. First, they left their old Sudbury home as the site was not suitable for development for a professional ground, to move to QPR's Loftus Road Stadium in Shepherds Bush. Then in 2002 they moved out of London altogether to share Wycombe Wanderers FC's ground, where they are currently tenants on a one-year rolling contract. The stadium's 10,000 capacity is adequate for the League Two football club, but as the current top side in Europe, Wasps are regularly playing to full houses and would like to be able to get more fans in. However, McGeechan says simply upping sticks and moving to somewhere bigger would not make sense, and they want to work together with the football club at Adams Park. "All the talk and all the thinking is to try and make progress where we are," he said. "Why try and grow another fan base somewhere else when we've just developed this one?". That view is shared, at least in part, by Copsey. "The good news is that Wycombe are a very progressive club, they're looking to change things and have great plans for the future, so you've got a very good partner on board already and together the clubs can achieve great things," he said. "What I won't do is automatically accept that option. We'll look at all options and then decide how to move it forward. "When I was at marketing director at Harlequins, I took bigger games to Twickenham. "If we were to be drawn at home to Munster in the opening game of the Heineken Cup, I think you would need a bigger venue as that's an occasion that demands a crowd of 30,000 plus. It's almost a bit negative not to look at that." But despite his openness to new ideas, Copsey says he does not forsee change for the sake of it at a club where winning has become such a habit. "Ian has done a great job, and the playing side of things is in safe hands, so that's one less thing to worry about, and all the contact I've had with the board is that they've very ambitious," he said. "They've had great growth over the last few years, they've invested a lot of money and have been very committed and they show no sign of steering from that. That's great news from the club."